Happy Wedding Wednesday, Maharanis! 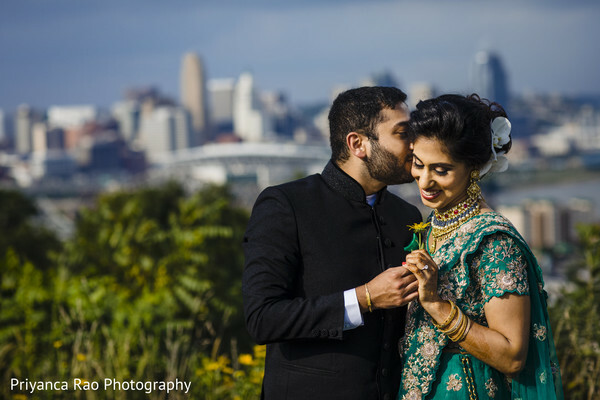 As part of our Best of 2018 weddings, today we've got the beautiful Indian nuptials of Alisha and Savio, masterfully planned and executed by Sonal J Shah Events! 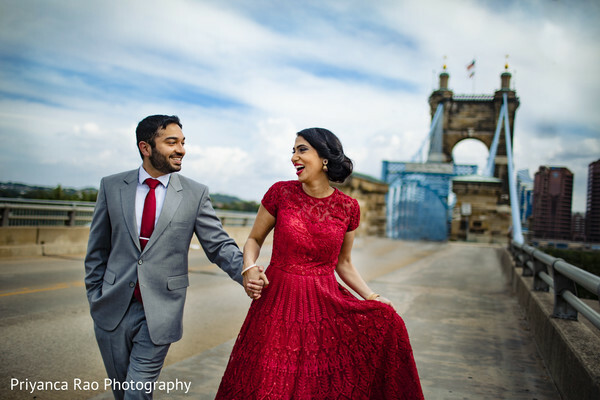 We are starting with an ecstatic pre-wedding photo session by the fearless and always talented photo team of Priyanca Rao Photography amidst the vibrant city of Cincinnati! 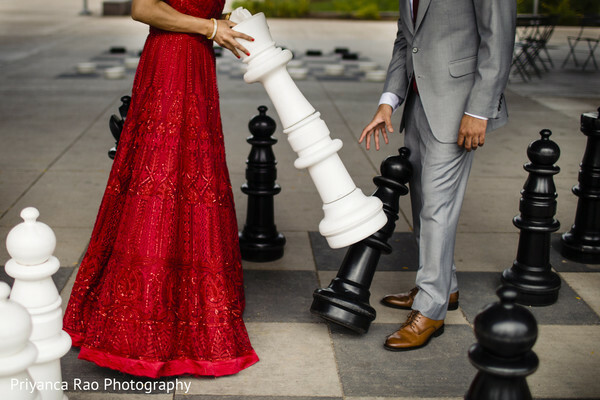 The magic urban setting contrasted flawlessly with the soon-to-be newlyweds' elegant outfits and together resulted in some seriously pretty portraits! 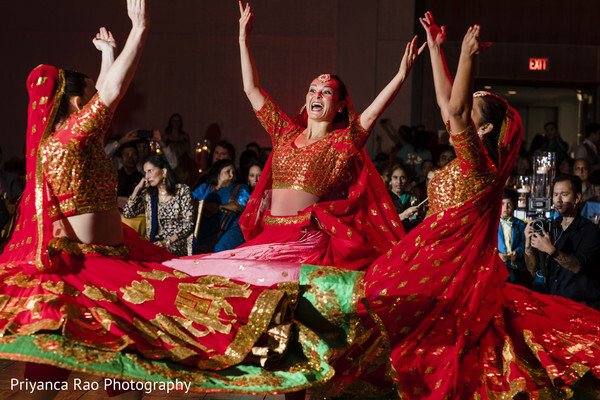 The fabulous wedding events kicked-off with a traditional mehndi night and was immediately followed by an extraordinary musical night! 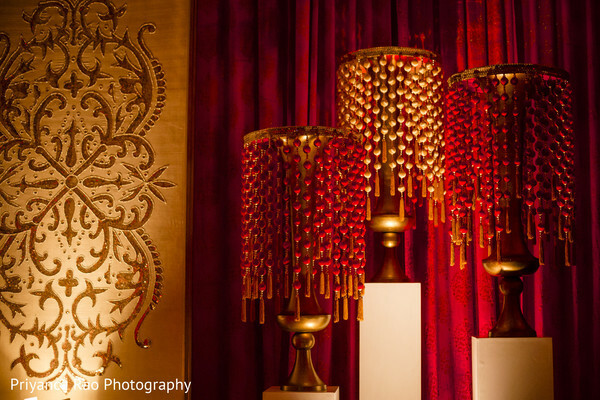 Weddings InStyle added the festive and striking red decor, featuring a fabulous candle wall and sophisticated crystal lamps. 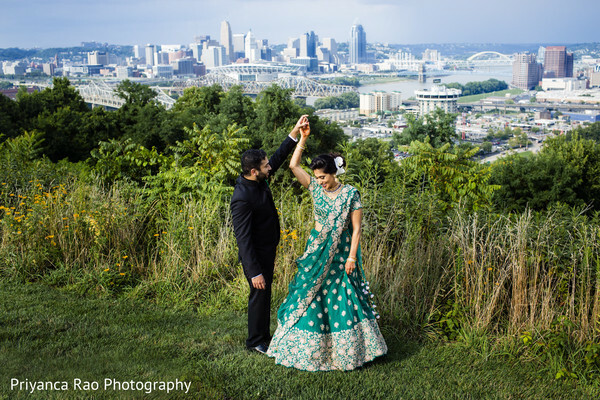 For this awaited pre-wedding celebration our lovely Maharani Alisha donned a mesmerizing floral teal color lehenga that was crowned with a graceful floral updo created by KC Makeup by Karuna Chani! For a fun-filled and energetic ambiance, the super talented AATMA Performing Arts took the live dance spectacle to the next level while the lovely twosome showed their best moves and steps as well! 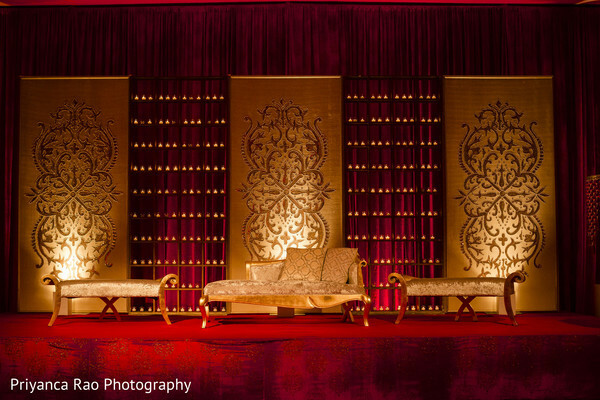 See all the Sangeet wonder for yourself in the complete gallery. Savio and I met when I went to visit one of my good friends in Cincinnati, where I had lived previously. We hit it off, and began dating long distance! I knew Savio was "the one" when I never got tired of spending time with him. I can be introverted and re-energize with alone time, but I actually felt better and more energized after I spent time with him. He felt like family to me. Savio proposed in Hyde Park in Cincinnati closeby where we had first met. We were at a get together with some of our friends when he suggested that we live to get ice cream at a local ice cream spot nearby. I thought that was peculiar for him but we both loved this place so we went. Shortly after we shared our banana split, Savio got on one knee and proposed. It was very special! We spent the rest of the weekend celebrating with our friends and family. Upon starting the wedding planning journey, I knew I needed someone who had good taste, direction, and choices. I was in the midst of my busy fellowship and did not live in the same city as my parents so I knew planning was going to be a bit of a challenge. After doing some research, we reached out to Sonal Shah who really vibed well with all of us. I knew that we wanted to get married in Cincinnati, Ohio because it was where we met and got engaged. 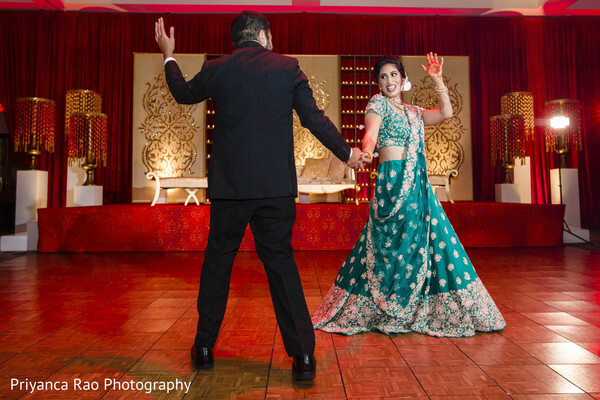 Sonal provided excellent options for both local and non-local vendors. What was really special about my hair and makeup was that my mom had been getting names and numbers of vendors even 10 years before I was engaged. Karuna Chani had come to Cincinnati, Ohio from NYC many years ago for a wedding, and my mom got her card. She still had Karuna's card and we called her up and booked her ASAP. It was the best decision we made because she showered my mom and me with positive vibes and was so much fun to get ready with. Every look that I had was exactly as I had wanted it, and I let her take the creative initiative with each step. My mom and I went to India to select my wedding clothes. Actually, because I was in the midst of fellowship, I only had 4 days in India. We had very productive days and made it happen in just a few days! I knew I wanted a red Sabyasachi gown before even going to India. The dress I chose was the first one I set my eyes on in the store. It was the best experience. The most enjoyable process of planning was spending time with my parents. We talked on the phone very often, and I was lucky because my mom took the initiative on most of the planning. She coordinated with Sonal and all the vendors. Going to India with them was so much fun, and I will never forget how we worked hard together to create a magical weekend, and it was exactly that! We were not stressed or worried about the whole weekend because we knew Sonal and her team had everything in control going forward. 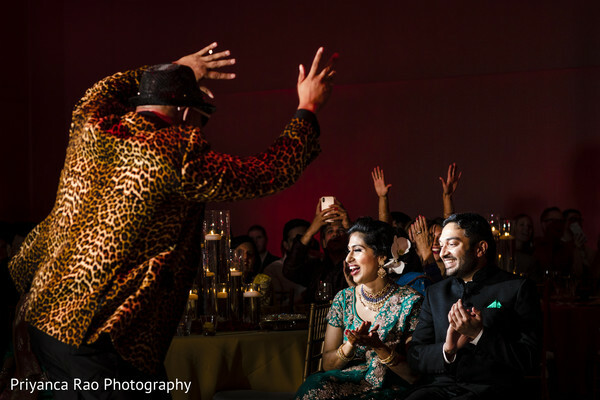 My guests loved the food, dancing, and overall ambiance of the wedding. I heard the cocktail hour was amazing with Dave Sharma on the electric tabla! The most special moment that plays in my mind was our first look. 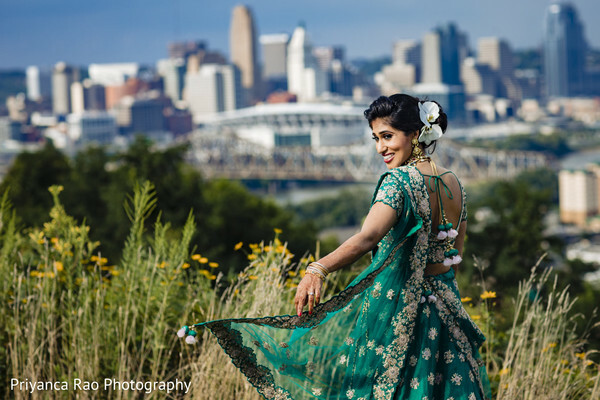 Priyanca picked out the most beautiful and scenic spot in downtown Cincinnati with a portrait of a woman in the background. The look on his face and spending that time alone together was my favorite. My words of wisdom would - enjoy the process! It goes so quickly, and it can be stressful at times, but hire your vendors early on and have a good wedding planner. Your weekend will then be amazing and unforgettable! Come back and check out the ceremony day fashion, coming up next! 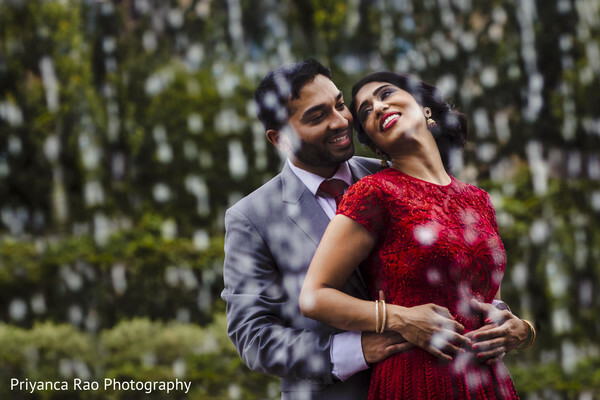 Weddings InStyle, AATMA Performing Arts and Priyanca Rao Photography are members of the Platinum Guide. Love what you see? Explore their portfolios.